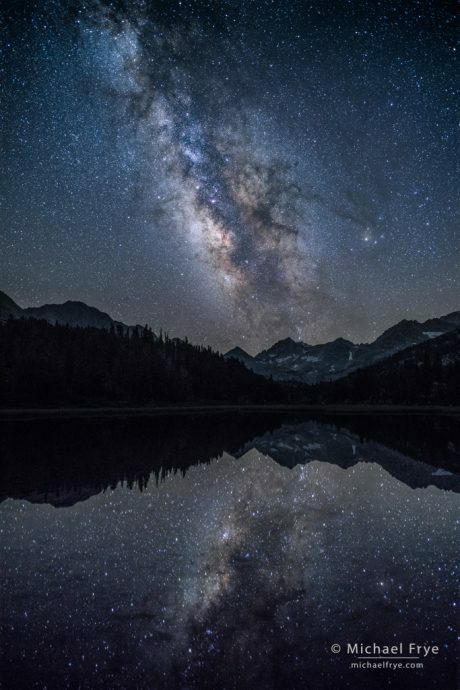 Milky Way, mountains, and reflections, Inyo National Forest. 20 frames blended together with Starry Landscape Stacker to reduce noise. Each frame was 10 seconds at f/2.5, ISO 12,800. As most of you know, California has endured a rash of wildfires in recent weeks. One of those fires, the Ferguson Fire, has been burning along the western edge of Yosemite for the last month. The park service eventually closed Yosemite Valley due to smoke and the threat of fire cutting off the roads that access the valley. Our recent Starry Skies Adventure workshop was based far away from the fire in Lee Vining, near Mono Lake, but the Ferguson Fire kept sending lots of smoke over the mountains, making it questionable whether we would be able to find clear skies. In the end, however, we were able to find surprisingly clear skies all three nights of the workshop. On our first night we went south toward Bishop, where there was less smoke, and made our way into the high country. Since smoke tends to settle into valleys at night, we found beautifully clear skies at 10,000 feet. On our second night the skies were even clearer near Bishop, so we photographed petroglyphs down in the Owens Valley. And while we dealt with some smoke on our last night in Bodie, it’s actually hard to tell in the photographs. Given the circumstances, things worked out amazingly well, which I’m very grateful for. And I think everyone in the group captured photographs they’re happy with – including me. I’ve posted a few of them here. The Ferguson Fire is now 83% contained, and Yosemite Valley will reopen to visitors on Tuesday. The fire is emitting much less smoke, and skies have been pretty clear here in Mariposa the past few days. Let’s hope that trend continues. Petroglyphs and Milky Way, Owens Valley. The petroglyph was only a few feet from the camera, so I made separate exposures to get both the stars and petroglyph in focus. 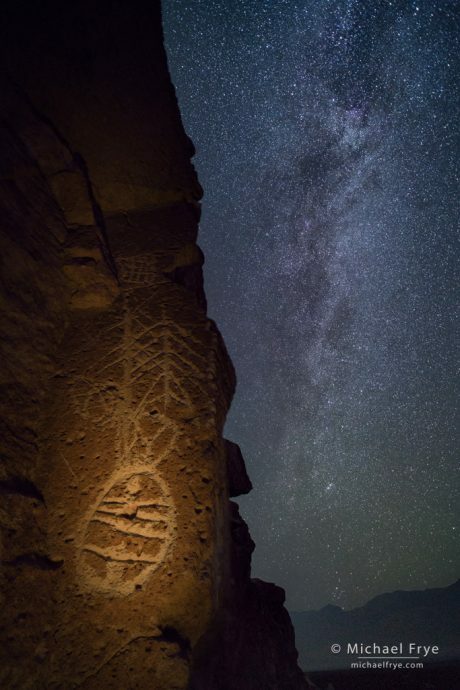 The stars were captured with a 20-second exposure at f/2.5, ISO 6400, while the petroglyph was 10 seconds at f/16, ISO 200, using a small flashlight to illuminate the rock. We speculated about the meaning of the petroglyph. It appears to depict a person falling, and one of our group, Patricia, joked that it was a woman who had been thrown off a cliff by her husband. But then again, the “legs” look like trees, or arrows, so maybe it’s not a figure at all. 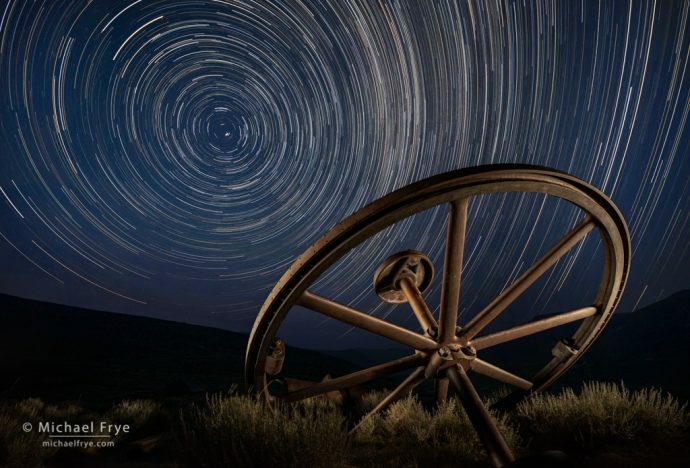 Petroglyphs and star trails, Owens Valley. This is about two hours of star trails, captured in a series of four-minute exposures (at f/4, ISO 800). 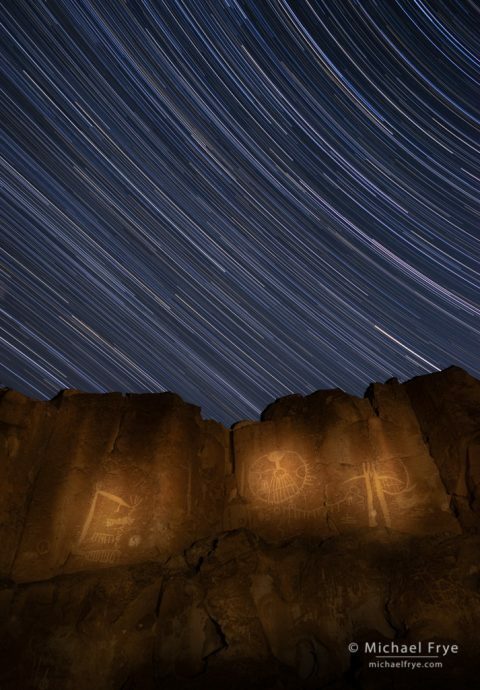 After stopping our star-trail sequences we made several additional exposures while light-painting the petroglyphs. Circles, Bodie State Historic Park. An homage to my friend Robert Eckhardt, who made a wonderful image of these circles many years ago. I joined two members of our group here, and each of us set up a composition, and started star-trail sequences at dusk (hence the blue sky), which we left running for about two hours (again using a series of four-minute exposures at f/4, ISO 800). Then, leaving our cameras in place, we made several more exposures to light the old pulley. Thanks for your interest in a Bodie workshop at night Donna. If we have space available in a Bodie workshop we’ll notify our email list – which it looks like you’re on. Thank you Michael for sharing these wonderful experiences. It reminds me of my first weekend off work at Devil’s Postpile during the summer of 1970, where I worked briefly on assignment from Yosemite Valley as a park ranger-naturalist. I went backpacking into the Minaret Wilderness. I had a small tripod with me that I purchased from Ansel Adams’ studio in Yosemite and had a cable release for my Nikkormat camera. Using Kodachrome II (ASA 25) slide film, I set up camp beside Minaret Lake, and pointed my camera towards celestial north, using the blackened silhouette of the Volcanic Ridge as a foreground. Just before retiring for the evening, I opened the shutter at f2.0 and focused on infinity. Then, I fell asleep, knowing that at some point I would wake up in the middle of the night to turn off the shutter. When the slide was finally developed, I was amazed at the results, there were many more stars than I could depict with my unaided eye. Not, knowing just how long I slept, nor how long the exposure, I used a protractor to measure the angular degrees of the star trails. To estimate exposure time, I divided by the number of degrees in 24 hours (i.e., 360). Thus, 52/360 = 0.144 or 14.4% of 24 hours. I had been asleep for 208 minutes or 3 hrs and 28 minutes! Nice story Owen – thanks! These photos are amazing, gives a perspective most of us would never see. Thank you for sharing.I hope there will be more coming. As a budding astro photographer, thank you so much for sharing your work and your knowledge. I really enjoy how you enhance the story telling of your images with words; kudos to you sir! Glad you enjoyed this Simon – thanks!